With Valentine’s Day falling on a Sunday this year, ditch the crowds and pricey pre-fixes and stay in. It will be a snap to plan and execute a delicious and romantic dinner for two or a fabulous dinner party for your close friends (couples or strictly the laadies.) Step one is to plan your tablescape. Check out these 5 tips for mastering your Valentine’s blooms at Glitter Guide. 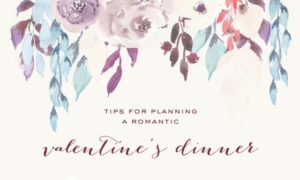 If you’re planning a dinner for more than two, print out some cute menus via a template online or skip the menus and learn how to fold your napkins into a heart. Serve your significant other or guests a fun signature cocktail. We also love the idea of making berry ice cubes and serving them in your water glasses to give your table an added pop of color. Cocktail recipes to try: Sparkling Cranberry Rose, Grapefruit & Sage Champagne Cocktail, Charleston Pink Lady Cocktail, Cardamom Rose Cocktail Next step is to plan your menu. For appetizers/hors d’oeuvres, you can never go wrong with a delicious cheese board. Other recipes to try are mouthwatering Bacon Wrapped Dates or Burrata with Roasted Aparagus & Tomato Salad. For the main course, forget the diet and go for something rich and decadent. One of the following dishes shown above are sure to be a hit! Red Wine Braised Short Ribs, Brown Butter Scallops with Parmesan Risotto, Beef Tenderloin with Cognac Cream Sauce, Sauteed Sole with Lemon, Pork Loin with Wine & Herb Gravy, Four Cheese Ravioli. And now for the best part – dessert! Make a delicious layer cake or individual desserts are always nice and can easily be made ahead of time. Recipes to try: Tiramisu, Chocolate Covered Strawberry Layer Cake, Chocolate Covered Pretzels, Salted Caramel Brownie Trifles, Individual Strawberry Shortcakes. Enjoy!